Weather reports are fickle. I held off on my planned outing to Grand Lake until today based on the forecast for “mostly sunny” skies. So when I woke up to a world socked in with clouds, I was dismayed. Still hoping for the promised clearing, I dawdled in a cosy coffee cafe in Grandby with my latte and muffin – a decidedly leisurely way to start the day. By the time I continued on my way the sun was starting to peak out, although the surrounding mountaintops were all still shrouded in clouds. 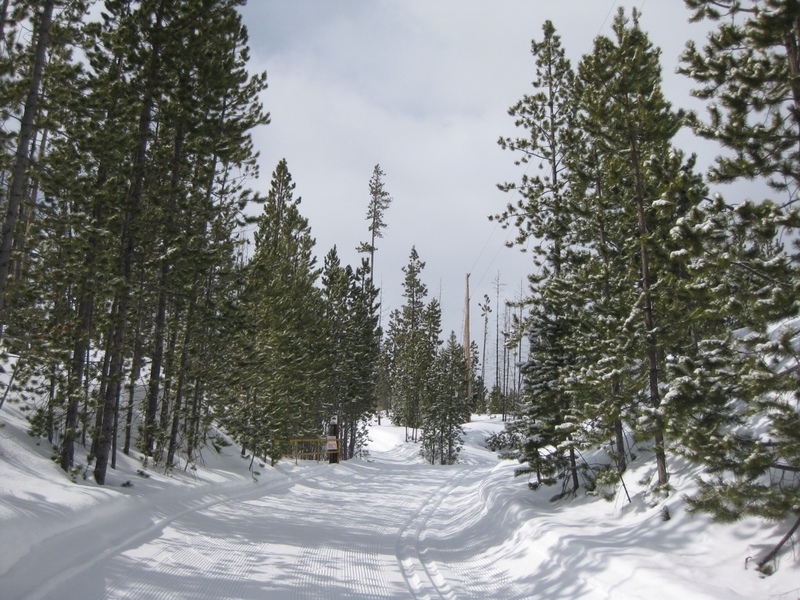 Ever hopeful, I drove on to the Grand Lake Nordic Center. With 5″ of fresh new snow on the ground, the world was a clean soft undulating surface blanketed in white. The fact that Grand Lake touts their “pristine grooming” was comforting, and I was further cheered upon my arrival to learn that all trails had just been groomed that morning. The Nordic Center is a comfortable building that converts nicely from its summer personality as the golf clubhouse. 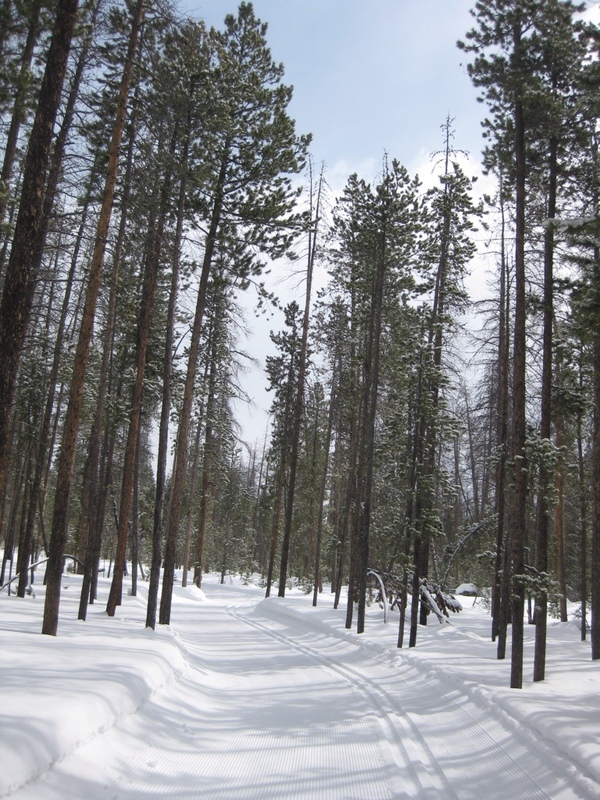 Expecting wide open trails on the golf course, I was mystified but thrilled to ski straight into a vast wooded area dominated by tall pole pines. With a firm new skate deck yet a soft snowy surface, the skiing was delightful – especially since there were only a handful of other skiers out on the whole system. I was the first skate skier down nearly every trail I skied – kilometers of fresh corduroy! True to the forecast, the day remained mostly sunny. The sun was out all day, although the clouds remained firmly entrenched around the edges. I decided that the woods were scenery enough for me, and that I would relish the sunshine. Mountaintops could wait for another day. As usual with a new trail system I found myself confounded by too many trail intersections, and was constantly checking my map. Sometimes I decided to just go where the spirit moved me – what difference did it make if I backtracked and covered the same loop twice? I was just out there for the fun, the outdoors and the sunshine. 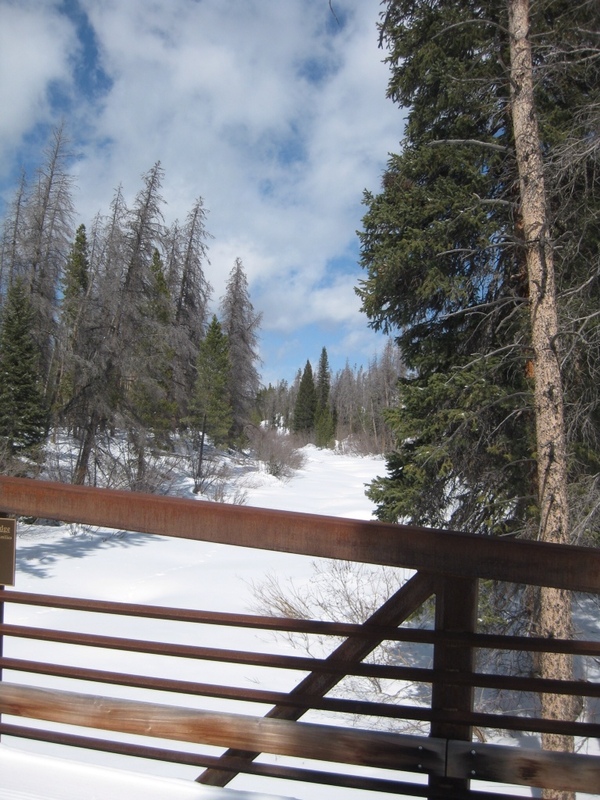 One portion of the trail crossed the Colorado River and paralleled it for a while. I deliberately skied that one twice. By the time I was done I think I covered nearly major piece of trail at least once. In the end, I did find the golf course. That's where the dog trails are – designated trails where dogs are allowed, and joyfully romp alongside their skiing masters. Since no dogs had gone ahead of me, those trails were as fresh as the rest. The wind did take its toll, however, blowing snow over the tracks even on a nice day like today. All the more reason to stick to the beautiful wooded trails. By the time I finished skiing, I managed to glimpse the snowy tops of one mountain range. Settling down to eat my lunch beside the wood fire in the Nordic Center, I had the same view out the window. Glorious. 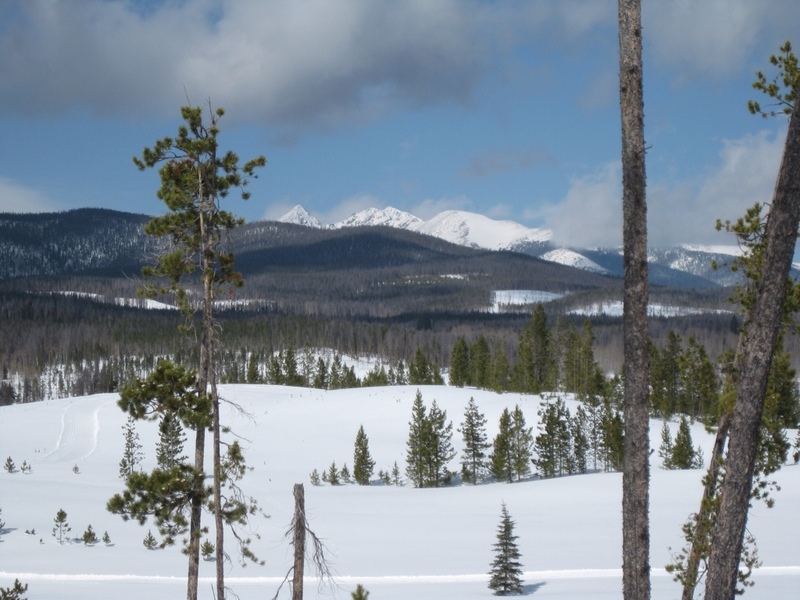 This entry was posted in Outdoors, Travel and tagged Cross-Country Skiing, Outdoors, Rocky Mountains, Snow Mountain Ranch by Molly. Bookmark the permalink.